This year’s annual Earth Conference, Nature is Speaking: Are You Listening took 120+ conference attendees on a journey to rediscover the importance of hearing Earth’s cries for help as well as her gentle reminders that we are all connected. 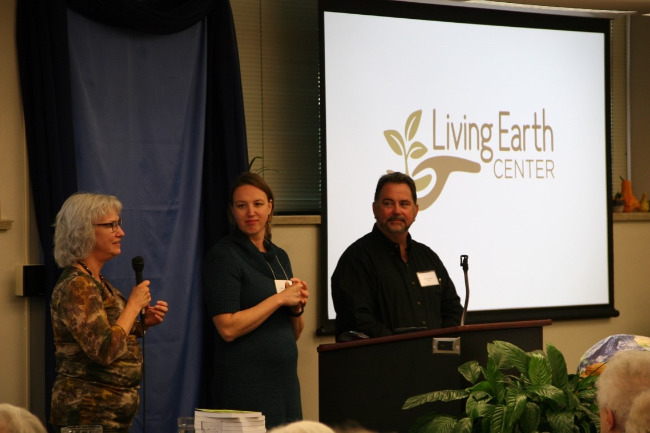 Tim Dewane, Director of the Justice, Peace, and Integrity of Creation Office for SSND, and Cheryl Leutjen, author of the book Love Earth Now: The Power of Doing One Thing Every Day were this year’s conference speakers. Their morning presentations focused on How Nature is Speaking to Us. Dewane shared examples of how Earth is speaking to us through the form of unprecedented climate change. From super typhoons in Asia to the migrant caravan travelling north from Central America climate change affects us all. “Unpredictability in weather is especially hard on those closely connected to the Earth,” he said, explaining why thousands of climate refugees have been forced to abandoned their land and join the caravan north. He shared a number of personal stories of people around the world, bringing home his point: “The reality is – we are all connected,” Dewane said. Leutjen spoke to finding hope in even the smallest individual actions. “If we don’t have hope, how can we move forward on any level?” she asked. She stressed that we are each endowed with our own gifts and that’s where we should focus or individual action. “Pick something,” she said, “do what you can with the skills that you’ve got.” She emphasized letting go of things you have no control over, trust the work to those doing it, thank them, bless them, and move on. “I feel good when I’m giving what I’ve got to give. It’s not about the small thing I’m doing, it’s about the great work love is doing,” she said.